ROYAL PALM BEACH — The neatly kept Kensington condominiums, fronted by a fountain, guard house and regal name, hold on to a pretense of Wellington wealth. But past the empty guard shack and through the long-broken electronic entry gates, bank notices are taped to abandoned units - scarlet letters of fiscal failure. Experts suspect more - that the condominium conversion was a crucible for fraud, a case study in real estate's rise and fall. A Palm Beach Post investigation of the 167-unit complex found evidence of straw buyers, value manipulation and fabricated documents. Questionable transactions by a title company and lender with several Kensington deals can explain at least of part of the neighborhood's staggering 73 percent foreclosure rate. Multiple sales so overpriced that the Palm Beach County Property Appraiser's Office alerted the FBI, noting "red flags everywhere." A closing statement with a faked 20 percent down payment. Multiple units sold to individual buyers, such as a Costco employee and a cabdriver, who couldn't afford them. A South Florida title agency that despite mounting consumer complaints, a 2009 fraud judgment against it and suspension by its underwriter, escaped state discipline until December 2010. Choice Title of South Florida imploded on its own well before the state moved to shut it down. The company's former president, who is still licensed in Florida, recently advertised for mortgage brokers and loan officers on her Facebook page. Bad loans awarded by a now defunct firm that had triple the default rate of comparable South Florida lenders when its license expired Jan. 1. Amerilend Mortgage's founder and president Jose Rivero was an executive in a bankrupt mortgage company and got his start as a loan officer with the infamous subprime lender Ameriquest. He has a mortgage broker application pending with the state. Today, just 22 owners of Kensington units live in their condos. Back in 2005, the Kensington was just an apartment complex. But with housing booming, it was soon scooped up by developer Carmel Investment Group, which had landed a $27.4 million mortgage with the soon-to-flounder Corus Bank to convert the apartments to condos. As real estate faltered, a prolific bulk buyer led by former Miami hoteliers appeared in late 2007 to rescue Carmel in what was dubbed a "sweetheart" deal for its unsold units. When the market free fall continued, the bulk buyer scurried to sell - to anyone. Paying, but not the owner: Ed Diaz of Kendall spent a year making mortgage payments on a condo in Kensington before learning that there was another owner. First-time buyer Ed Diaz purchased Kensington unit 102 at 260 Crestwood Circle in February 2009. He paid the mortgage on it for more than a year before learning the home was also owned by someone else. Miami resident Madelin Ayala, who says her November 2008 closing fell through, is listed as the owner of record. "I can assure you with a high degree of probability that this whole thing is fraudulent," said Scott Bice, a director with the U.S. Department of Housing and Urban Development who reviewed Diaz's closing statements for The Post. But distinguishing that fraud is more complicated. In the world that was rock'em, sock'em real estate, transactions blur, loans are sold, documents get lost, and public records can only tell so much. One thing is clear: Kensington's remaining original owners feel cheated. But Diaz and Ayala are in the real muddle. "It's gotten to the point where I don't even want to be involved in this whole mess anymore," Diaz said. "I want to get it off my hands however I can." Unit 102 was to be Diaz's retirement sanctuary when the 62-year-old could finally break from his job driving the elevated trains of Miami-Dade's Metrorail. His claims to the home were his February 2009 deed and original mortgage, but neither was entered into county records. "The whole thing doesn't make sense," said V. Claire Wyant-Cortez, an attorney representing Kensington's homeowners association. The property appraiser's office was saying the same thing in late 2008 and early 2009 when 1,500-square-foot Kensington townhomes were selling for as much as $340,000. It was two years past the market peak and the sky-high prices for condos five miles west of Florida's Turnpike were unjustifiable. Also, multiple units were selling to individual buyers who should never have been able to afford them. A 34-year-old Costco optician from San Diego paid $913,000 for three units. An Oregon paper mill repairman bought four units for $1.2 million. An Illinois cabdriver married to a Whole Foods cook bought two units for $671,855. And a 38-year-old convicted drug trafficker purchased five units for $1.68 million. The Costco employee, paper mill worker, and cabdriver have all since declared bankruptcy. "You couldn't put your finger on it exactly, but you just knew something was wrong," said Pamela Lamb, manager of the condominium department at the county property appraiser's office. "This one really stood out to us." The office contacted the FBI. At about the same time, Old Republic National Title Insurance Company flagged Kensington. In a July 2008 alert, it prohibited its agents from handling titles for Kensington units without prior written approval from higher-ups in the company. The FBI won't say whether there is or was an investigation. It was while looking into the possibility of a short sale of his condo that Diaz learned of his Kensington predicament. His retirement dream, already dashed by an upside-down mortgage, was about to collapse. A friend interested in buying the unit found Ayala's deed and mortgage in public records, but not his. In loan paperwork Diaz provided to The Post, there is a 20 percent down payment of $61,980 reflected in his HUD-1 statement. But Diaz said he put no money down. Bice, the HUD director who reviewed Diaz's statement, also noted that all of the closing costs were paid by the seller. He said he suspects a type of fraud called a "builder bailout." For example, a property worth $100,000 is sold to a buyer for $120,000, but with no down payment required by the developer/builder. The buyer borrows $100,000 from the bank, which believes he is putting down 20 percent. Artificially increasing the sale price misleads future appraisals by keeping costs high. Also it could be that the lender was only accepting loans with 20 percent down, meaning the closing documents had to be contrived to reflect the non-existent down payment. "Someone made it look to the mortgage company that he was putting 20 percent down," Bice said. "In effect, Mr. Diaz becomes a straw buyer." Mystery No. 2: Which company owned the unit? Another problem with Diaz's purchase is that his warranty deed shows the seller as the original developer, CarmelKen P, which bought the Kensington in 2005. But CarmelKen had been bought out by Kensington Trust, LLC, in a bulk deal a year before Diaz's closing. If Diaz was going to buy from anyone, it should have been Kensington Trust. Ayala's deed shows that her Nov. 12, 2008, purchase was from Kensington Trust. Ayala disputes owning unit 102, telling the attorney for Kensington's homeowners association that her deal fell through. Rashmi Airan -Pace, a Miami attorney who handled the closing, disagrees with Ayala. Airan-Pace reviewed her files at The Post's request. She found nothing out of the ordinary, noting that she has copies of Ayala's driver license and a cashier's check for more than $60,000. "It happened just as it was supposed to happen," Airan-Pace said. Diaz admits he was naive about the purchase. Like so many buyers caught up in the boom, Diaz said he relied on the expertise of the mortgage broker and title company to guide him through the sale. Amerilend Mortgage Co., which handled the loans of Ayala, Diaz and at least 18 other Kensington buyers, no longer exists. It's possible Amerilend was involved in even more Kensington loans, but its name only appears in public records when it closes as a loan correspondent. When the Plantation-based Amerilend's license expired Jan. 1, its loan default rate was 314 percent higher than comparable South Florida lenders, according to HUD. All but one of Amerilend's known Kensington loans has been foreclosed on, in some instances within a year of the condo purchase. Amerilend often used Choice Title of South Florida to handle transactions, and was the agent for Diaz. The company, which is being sued by its underwriter Old Republic National Title Insurance Company, closed its doors in fall 2009. More than a year later, on Dec. 30, the Florida Office of Financial Services filed an administrative complaint against Choice Title, threatening to shut it down. The threat follows consumer complaints that had been mounting since 2004. Phone numbers listed for Choice Title and its owner were either no longer in service or not accepting incoming calls. A Facebook message to the owner was not returned. Now working with a property management company, Kensington is cleaning up after the real estate maelstrom, including collecting late association dues. In February, the homeowners association filed for foreclosure on Ayala, who owns the same unit as Diaz, for failing to pay $3,821 in fees and despite her insistence that her closing fell through. Diaz remains foreclosure free. He stopped his mortgage payments about a year ago. The homeowners association now collects the monthly rent from tenants who had been paying Diaz. "There's been so many twists and turns, I can't keep track," said Diaz, who continues to hope for a short sale. But that future remains as clouded as the title to unit 102 at 260 Crestwood Circle. Ed Diaz bought unit 102 at 260 Crestwood Circle in February 2009 from Kensington’s developer CarmelKen LLLP for $309,900, but neither his deed nor original mortgage were filed in Palm Beach County court records. He also claims his loan documents reflect a fictitious 20 percent down payment. Madelin Ayala bought unit 102 at 260 Crestwood Circle in November 2008 from bulk buyer Kensington Trust, LLC for $309,900. She’s the owner of record for the property with a deed and signed mortgage recorded, but she claims her closing fell through and never occurred. Choice Title of South Florida closed Diaz’s loan and was responsible for filing his paperwork. Both the company and owner Milissa Hernandez are in trouble with the state and underwriter Old Republic for failing to disburse payments and record documents on several loans throughout the state. Amerilend Mortgage, which had a loan default rate 3 times higher than comparable lenders when its license expired this year, was the lender for both Ed Diaz and Madelin Ayala. Amerilend’s founder and former president Jose Rivero said the company collapsed in 2010 because of lack of money. It likely would have closed anyway this year because HUD eliminated ‘loan correspondents’ — a category of mortgage company that included Amerilend — in an effort to increase accountability. Kensington Trust LLC bought dozens of units in a bulk buy that was called a ‘sweetheart’ deal at the tail end of the boom. It was led by former Miami Beach hotelier Abbey Berkowitz, who with her company ABBA Real Estate were prolific buyers of condominium conversions in Southeast Florida and the Tampa area. Amerilend Mortgage was doing gangbuster business at the Kensington of Royal Palm Beach just three months after getting its state license. During the summer of 2008, with the housing market in free fall, the small Plantation-based firm turned $2.34 million in home loans at the condo community 6 miles west of Florida's Turnpike. It would add at least another $2 million by the year's end. But the success was illusory. Of the Kensington loans Amerilend underwrote and then sold to larger lenders, all but one went bad. 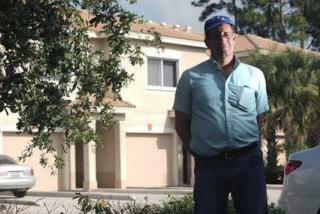 Six were in foreclosure within a year of their sale date, a Palm Beach Post investigation found. The single deal that escaped bank repossession was sold in another Amerilend transaction so suspect that county officials forwarded it to the FBI. The community is crippled with a 73 percent foreclosure rate. Contributing to its near collapse is a tangle of Amerilend transactions that include deals done with Choice Title of South Florida - a failed company whose owner is facing a state administrative complaint and a lawsuit from her former underwriter. According to Amerilend's owner, the short-lived company fell apart in 2010 because of a "lack of money." By the time its license expired this year, its loan default rate was more than 300 percent higher than comparable South Florida lenders, HUD records show. When asked why the failure rate was so high, Amerilend's founder and former president said he didn't know. "I was just the owner," said 30-year-old Jose Rivero, who has an application pending with the state for a mortgage broker's license, but was not required to have one when he owned Amerilend. "I just funded the company." While most of Amerilend's Kensington customers are long gone - their homes in bank custody or resold for tens of thousands of dollars less - at least three owners are still dealing with repercussions from buying the American Dream with Amerilend money. Ed Diaz and Madelin Ayala were both Amerilend customers. The two strangers unwittingly purchased the same unit at the Kensington, three months apart and from different owners. Choice Title handled Diaz's closing, but never filed his deed or mortgage with the county. Diaz also said his closing statement reflects a 20 percent down payment that he never made. Ayala, the owner of record with a deed and mortgage on file, claims her closing fell through and that she never purchased the unit. The third Kensington owner, Nathaniel Lundy, bought his 1,500-square-foot unit in May 2009 for $325,000. The high sales price so far into the real estate meltdown prompted county property appraisers to alert the FBI to the sale. Also handled by Choice Title, neither Lundy's deed nor mortgage were filed until February 2010 - nine months after his sale was final. But Lundy wasn't the only one paying a high price. In the fall of 2008, two years past the market's peak, Amerilend was making loans on Kensington units with sale prices between $272,900 and $340,000. In 2008, the Palm Beach County property appraiser pegged Lundy's unit at $201,000. Its current value is $77,000. "We started getting calls from private appraisers asking why the prices were so high," said Pamela Lamb, manager of the condominium department at the property appraiser's office. "The analysts here said, 'These prices, we can't make any sense of them.' "
As an FHA-approved loan correspondent, Amerilend acted as a broker for banks, in which case its name would not appear on public documents. But it also did its own underwriting on loans - transactions that would include its name. So Amerilend could have been involved in more than the Kensington loans directly tied to it in Palm Beach County records. The Federal Housing Administration got rid of loan correspondents - a minimal standard lender category that required just $63,000 in net worth - last year in efforts to increase accountability. It had been the FHA's responsibility to monitor the correspondents. But as the number of lenders multiplied during real estate's surge, it found oversight impossible, said Andy Seepersad, chairman of the government affairs committee of the Florida Association of Mortgage Professionals. "The FHA had rigid standards. The problem is, during the boom, they couldn't enforce the rules. They couldn't police everyone," Seepersad said. Amerilend, in fact, was never federally audited, said Joseph Phillips, a public affairs officer for the U.S. Department of Housing and Urban Development. Two of the company's deals that attracted the attention of the Palm Beach County Property Appraiser's Office - those of Lundy and Diaz - do not even list Amerilend on loan documents. Only the loan buyer, Freedom Mortgage, can be found on official records. Freedom Mortgage confirmed the loans to Nathaniel Lundy and Ed Diaz were both brokered by Amerilend. Although not in foreclosure, Diaz stopped paying his mortgage last year when he realized his ownership was in question. Lundy got a loan modification in October that fixed his interest rate at 3 percent and extended his loan to 40 years. "When I realized what I had gotten into, it was already too late," said Lundy, a Fort Lauderdale resident, about buying the unit that he now rents out. "I was like, 'What the heck did I buy?' I feel like I got scammed." Without seeing all of the loan paperwork - documents not subject to public record - it's impossible to know if that's true, said Dan Shlufman, a mortgage fraud expert and president of FCMC Mortgage Corp., which has offices Pennsylvania and New Jersey. But he has his suspicions. "The problem with this whole situation is you are trying to attack it rationally and it's not a rational transaction," Shlufman said after reviewing closing paperwork for Lundy, Diaz and Ayala. "This is not a case of just one person being duped."